In Honolulu, with a huge orchestra honoring her with their lush support, Rosemary Clooney performed for an equally vast audience at the Neal S. Blaisdell Concert Hall. Her latest album, Sentimental Journey, had just been released. Communicating with her audience on several levels, “The Girl Singer” presents songs from her recent album along with a few surprises. Her dialogue with the audience is captured in its entirety, which makes this album quite special. Matt Catingub’s big band and the Honolulu Symphony Pops Orchestra are impeccable. Clooney sounds good. Her unique phrasing, her relaxed sense of swing, and her smiling vocal timbre pervade the performance. 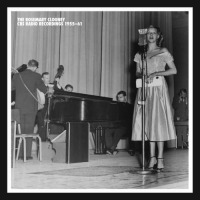 The album concludes with a patriotic moment that stands tall in service to everything that Rosemary Clooney stood for. Persuading the audience to join her in song, she’s able to reveal, in “God Bless America,” the independent spirit that carried her from Maysville, Kentucky at age 16 through numerous recording contracts, a nurturing family existence that found her raising five children, dedicated service to the television and motion picture industry, and countless successful hits that overwhelmed a worldwide audience. Now that she’s gone, we find it inevitable that we miss her; but a recording such as this one makes it a bit easier to understand. Personnel: Rosemary Clooney- vocals; Big Kahuna and the Copa Cat Pack: Matt Catingub- leader, alto saxophone, piano; Albert Alva, Jeff Prinz- alto saxophone; Matt Cowan- tenor saxophone; Jennifer Lovejoy- baritone saxophone; Dave Scott, Tony Bonsera, Mike Olmos- trumpet; Doug Beavers, Greg Saul- trombone; Dan Parenti- bass; Stephen Moretti- drums; Honululu Symphony Orchestra:Matt Catingub- pops conductor; Ignace Jang- concertmaster, violin; Claire Sakai, Judy Barrett, Janet Dubay, Rami Gapner, Katharine Hafner, Daniel Padilla, Jason Pell, Maile Reeves, Sheryl Shohet, Nancy Shoop-Wu, James Stanford, Gregory Wrenn, Keiko Saito Zou, Hung Wu, Darel Stark, Naomi Guy, Joan Hayden, Helen Higa, Arlene Koh, Laurilyn Krantz, Timothy Leong, Duane Padilla, Amanda Schubert, Fumiko Wellington, Duane White, Iolani Yamashiro, Nicholas C. Zou- violin; Mark Butin, Steven Flanter, William Bailey, Jean-Michael Jacquon, Teresa Skinner, Melvin Whitney, Anna Womack, Sandra Wong- viola; Gregory Dubay, Andrew Eckard, Pauline Bai, Karen Bechtel, Louise Kefford Ching, Joanna Fleming, Karen Fujimoto, Susie Lee, Nancy Masaki- cello; Kirby Nunez, Michael Gorman, Peter Askim, Leon Burton, John Gallagher, John Kolivas- bass; Laurie Lake- flute, piccolo; Susan McGinn, Emma Moon- flute; Scott Janusch, Nancy Dimock, Catherine Del Russo- oboe; Jason Lichtenwalter- oboe, English horn; Scott J. Anderson, James Moffit, Robert Larm- clarinet; Norman Foster- clarinet, E-flat clarinet; Laurel Hall- clarinet, bass clarinet; Paul H. Barrett, Marsha Schweitzer- bassoon; Philip Gottling III- bassoon, contrabassoon; Ken Friedenberg, George Warnock, Jonathan Parrish, Wade Butin, Eric Kop, Michiko Singh- French horn; Michael Zonshine, Mark Schubert, Kenneth Hafner- trumpet; James T. Decker, Eric Mathis- trombone; Michael Szabo- bass trombone; David Salzman, Jerome Stover- tuba; James Lee Wyatt III, Riely Francis, Gabriel Sobieski- percussion; Stephen Dinion- percussion, timpani; Stuart Chafetz- timpani; Constance Uejio- harp; Beebe Freitas, Nyle Hallman- keyboard.